Spag Bol is my absolute favourite meal in the world. I honestly would eat it every day and, provided it was a good recipe, would never tire of it. I've written before about having to twist my grandad's arm to get him to let my mum make it. Eventually, we got to a point where he actually made it for the family. He used to laugh at the recipe I wrote out for him because it included 'two squirts of garlic' in the ingredient list. We used to use Gia Garlic Puree in a tube (in fact, I still use it sometimes) but because he wasn't a 'throw it all in the pot and see how it turns out' cook, he could never quite figure out how much two squirts was. I think it's because he was an accountant and everything had to be perfectly counted in his world. The husband is very much like him. He used to make spag bol when I first met him. Whereas I'm very much of the tweak-as-you-go school, he mechanicially made his recipe time after time with no variation. Spag bol. On a plate. Sorted! Of course, this caused me trouble because no two spag bols I produced ever tasted the same. Even if I use all the same ingredients and am consistent with my quantities of mince, onions and tomatoes; the twiddly bits (Bovril cubes, Lea and Perrins, bacon, carrots, celery, mushrooms, wine, herbs) may or may not make an appearance - and in varying quantities each time. For me, it always tasted somewhere between okay and amazing because I adore spag bol. But the hubby couldn't deal with the variance. 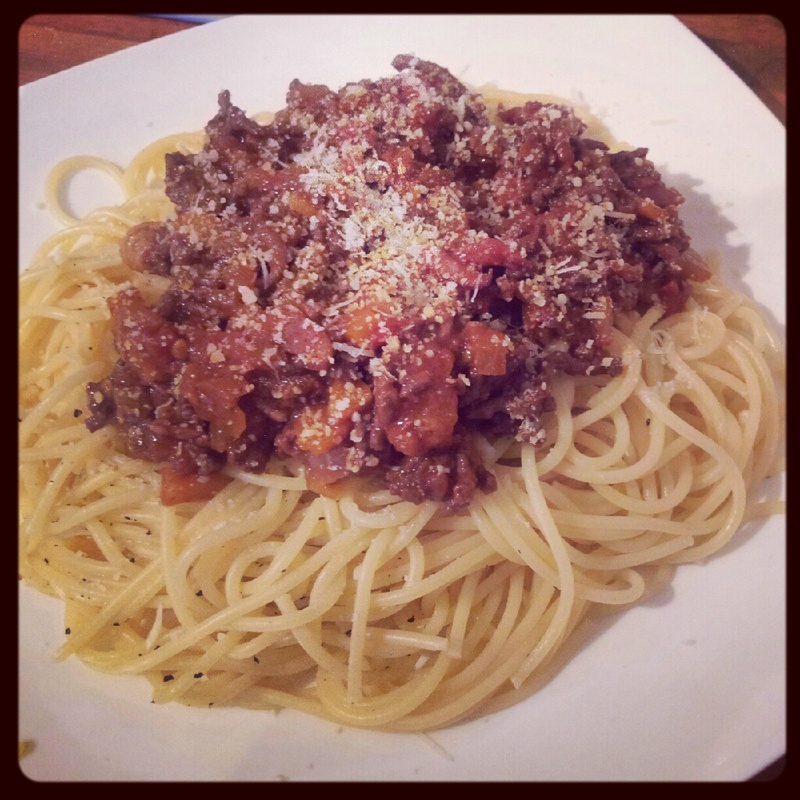 When I started this blog, I wanted to find the ultimate spag bol recipe that I would promise to myself I'd never tweak. But I've not been brave enough to make it for him again until now. Miss A and I eat it sometimes but since I found a recipe for meatballs he loves (Waitrose meatballs with Rachel Allen's pasta sauce - homemade of course! ), he refuses to eat spag bol. Given that we're on holiday and I have decided that I will only be cooking one meal each night for the duration, he is going to have to eat up and shut up for once. I may ask his opinion but sometimes his honesty is a little brutal (I've learned never to ask if my bum looks big in anything - you can read some of his critical feedback here). I found this recipe by Googling for 'The Ultimate Spaghetti Bolognese'. This comes straight from a real, genuine Italian chef who is unimpressed by various English variations on a classic dish. I find that amusing because my understanding was that Italians don't really eat Spag Bol. Instead, eating a similar meat ragu which comes with something other than spaghetti (can't remember exactly what). But whatever, I have to give it a whirl if you'll pardon the pun. Sorry for yet another pre-written blog post - don't worry, I will update them all soon! In the meantime, if you want to try it yourself, you can find the recipe here. Well the verdict was 'It's just spag bol'. It wasn't a bad spag bol. For someone who loves spag bol as much as I do, it was very edible. It just didn't set my world on fire, thus leaving me still bereft of the ultimate go-to spag bol recipe. There will definitely be further research in this area in the future when I start my new blog and I'm not having to post every single day. I know that a combination of beef and pork or veal mince is supposed to work very well so I have some options to try. But I did achieve my ultimate goal of ensuring that all three family members ate the same thing at the same time with this recipe. Job done.